For other rivers of the same name, see Saraswati River (disambiguation). The Ghaggar river flowing through Panchkula, Haryana, India. The Ghaggar-Hakra system has been identified as the Vedic Sarasvati river by many modern researchers. The Sarasvati River (Sanskrit: सरस्वती नदी sárasvatī nadī) is one of the main Rigvedic rivers mentioned in the scripture Rig Veda and later Vedic and post-Vedic texts. It plays an important role in Hinduism, since Vedic Sanskrit and the first part of the Rig Veda are regarded to have originated when the Vedic people lived on its banks, during the 2nd millennium BCE. The goddess Sarasvati was originally a personification of this river, but later developed an independent identity. The Nadistuti hymn in the Rigveda (10.75) mentions the Sarasvati between the Yamuna in the east and the Sutlej in the west. Later Vedic texts like the Tandya and Jaiminiya Brahmanas, as well as the Mahabharata, mention that the Sarasvati dried up in a desert. The Sarasvati is also considered by Hindus to exist in a metaphysical form, in which it formed a confluence with the sacred rivers Ganges and Yamuna, at the Triveni Sangam. The name Sarasvati was also given to a formation in the Milky Way. Modern scholars have identified the Sarasvati River with the Ghaggar-Hakra River system, which flows through northwestern India and Pakistan. This was proposed by several scholars in the 19th and early 20th century. More recently, satellite images have confirmed that a more significant river once followed the course of the present day Ghaggar River. Indian Remote Sensing satellite data, along with digital elevation models, were combined with historical maps, archaeological sites, hydro-geological and drilling data to chart this river's course. It was observed that major Indus Valley Civilization sites at Kalibangan (Rajasthan), Banawali and Rakhigarhi (Haryana), Dholavira and Lothal (Gujarat) also lay along this course. Another theory suggests that the Helmand River of southern Afghanistan corresponds to the Sarasvati River. Sarasvatī is an exact cognate with Avestan Haraxvatī, perhaps originally referring to Arədvī Sūrā Anāhitā (modern Ardwisur Anahid), the Zoroastrian mythological world river, which would point to a common Indo-Iranian myth of a cosmic or mystical Sáras-vat-ī river. In the younger Avesta, Haraxvatī is Arachosia, a region described to be rich in rivers, and its Old Persian cognate Harauvati, which gave its name to the present-day Hārūt River in Afghanistan, may have referred to the entire Helmand drainage basin (the center of Arachosia). The Saraswati river was revered and considered important for Hindus because it is said that it was on this river's banks, along with its tributary Drishadwati, in the Vedic state of Brahmavarta, that Vedic Sanskrit had its genesis, important Vedic scriptures like Manusmriti, initial part of Rigveda and several Upanishads were supposed to have been composed by Vedic seers. In the Manusmriti, Brahmavarta is portrayed as the "pure" centre of Vedic culture. Bridget and Raymond Allchin in The Rise of Civilization in India and Pakistan took the view that "The earliest Aryan homeland in India-Pakistan (Aryavarta or Brahmavarta) was in the Punjab and in the valleys of the Sarasvati and Drishadvati rivers in the time of the rigveda." In 2015, Reuters reported that "members of the Rashtriya Swayamsevak Sangh believe that proof of the physical existence of the Vedic river would bolster their concept of a golden age of Hindu India, before invasions by Muslims and Christians." The Bharatiya Janata Party Government had therefore ordered archaeologists to search for the river. The Sarasvati River is mentioned in all but the fourth book of the Rigveda. The most important hymns related to Sarasvati are RV 6.61, RV 7.95 and RV 7.96. The Sarasvati is praised lavishly in the Rigveda as the best of all the rivers: e.g. in RV 2.41.16 she is called ámbitame nádītame dévitame sárasvati, "best mother, best river, best goddess". Other verses of praise include RV 6.61.8-13, RV 7.96 and RV 10.17. In some hymns, the Indus river seems to be more important than the Sarasavati, especially in the Nadistuti sukta. In RV 8.26.18, the white flowing Sindhu 'with golden wheels' is the most conveying or attractive of the rivers. Vipas and Sutudri speed down their waters. Strong attention has been given to the Sarasvati River in the Rigveda along with several suktas dedicated to it. As such it seems there are a number of Sarasvatis with the earliest Sarasvati not identifiable with the Hakra and Ghaggar. The Sarasvati River is perceived to be a great river with perennial water. The Hakra and Ghaggar cannot be compared to it. The earliest Sararvati is said to be similar to the Helmand in Afghanistan which is called the Harakhwati in the Āvestā. 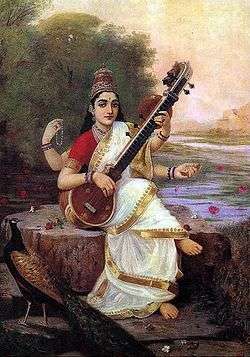 The phrase sárasvatī saptáthī síndhumātā of RV 7.36.6 has been rendered as " Sarasvati the Seventh, Mother of Floods" in a popular translation. While this takes a tatpurusha interpretation of síndhumātā, the word is actually a bahuvrihi. "Pavaka nah saravati, vajebhir vajinivati; Yajnam vastu dhiyavasuh. Codayitri sunrtanam, cetanti sumatinam; Yajnam dadhe sarasvati. Maho arnah sarasvati, pra cetayati ketuna; Dhiyo visva vi rajati"—verse from Rigveda The complete translation would be in Sri Aurobindo's own words: "May purifying Sarasvati with all the plenitude of her forms of plenty, rich in substance by the thought, desire our sacrifice. "She, the impeller to happy truths, the awakener in consciousness to right mentalisings, Sarasvati, upholds the sacrifice." "Sarasvati by the perception awakens in consciousness the great flood (the vast movement of the ritam) and illumines entirely all the thoughts "
The late Rigvedic Nadistuti sukta enumerates all important rivers from the Ganges in the east up to the Indus in the west in a clear geographical order. Here (RV 10.75.5), the sequence "Ganges, Yamuna, Sarasvati, Shutudri" places the Sarasvati between the Yamuna and the Sutlej, which is consistent with the Ghaggar identification. Verses in RV 6.61 indicate that the Sarasvati river originated in the hills or mountains (giri), where she "burst with her strong waves the ridges of the hills (giri)". It is a matter of interpretation whether this refers only to the Himalayan foothills, where the present-day Sarasvati (Sarsuti) river flows, or to higher mountains. Citra is King, and only kinglings [rājaka] are the rest who dwell beside Sarasvati. The Sarasvati is mentioned some fifty times in the hymns of the Rig Veda. it is mentioned in thirteen hymns of the late books (1 and 10) of the Rigveda. Only two of these references are unambiguously to the river: 10.64.9, calling for the aid of three "great rivers", Sindhu, Sarasvati and Sarayu; and 10.75.5, the geographical list of the Nadistuti sukta. The others invoke Sarasvati as a goddess without direct connection to a specific river. In 10.30.12, her origin as a river goddess may explain her invocation as a protective deity in a hymn to the celestial waters. In 10.135.5, as Indra drinks Soma he is described as refreshed by Sarasvati. The invocations in 10.17 address Sarasvati as a goddess of the forefathers as well as of the present generation. In 1.13, 1.89, 10.85, 10.66 and 10.141, she is listed with other gods and goddesses, not with rivers. In 10.65, she is invoked together with "holy thoughts" (dhī) and "munificence" (puraṃdhi), consistent with her role as a goddess of both knowledge and fertility. Though Sarasvati initially emerged as a river goddess in the Vedic scriptures, in later Hinduism of the Puranas, she was rarely associated with the river. Instead she emerged as an independent goddess of knowledge, learning, wisdom, music and the arts. The evolution of the river goddess into the goddess of knowledge started with later Brahmanas, which identified her as Vāgdevī, the goddess of speech, perhaps due to the centrality of speech in the Vedic cult and the development of the cult on the banks of the river. It is also possible that two independently postulated goddesses were fused into one in later Vedic times. Aurobindo has proposed, on the other hand, that "the symbolism of the Veda betrays itself to the greatest clearness in the figure of the goddess Sarasvati...She is, plainly and clearly, the goddess of the Word, the goddess of a divine inspiration...". In post-Rigvedic literature, the disappearance of the Sarasvati is mentioned. Also the origin of the Sarasvati is identified as Plaksa Prasravana (Peepal tree or Ashwattha tree as known in India and Nepal). In a supplementary chapter of the Vajasaneyi-Samhita of the Yajurveda (34.11), Sarasvati is mentioned in a context apparently meaning the Sindhu: "Five rivers flowing on their way speed onward to Sarasvati, but then become Sarasvati a fivefold river in the land." According to the medieval commentator Uvata, the five tributaries of the Sarasvati were the Punjab rivers Drishadvati, Satudri (Sutlej), Chandrabhaga (Chenab), Vipasa (Beas) and the Iravati (Ravi). The Plaksa Prasravana (place of appearance/source of the river) may refer to a spring in the Siwalik mountains. The distance between the source and the Vinasana (place of disappearance of the river) is said to be 44 asvina (between several hundred and 1600 miles) (Tandya Br. 25.10.16; cf. Av. 6.131.3; Pancavimsa Br.). In the Latyayana Srautasutra (10.15-19) the Sarasvati seems to be a perennial river up to the Vinasana, which is west of its confluence with the Drshadvati (Chautang). The Drshadvati is described as a seasonal stream (10.17), meaning it was not from Himalayas. Bhargava has identified Drashadwati river as present day Sahibi river originating from Jaipur hills in Rajasthan. The Asvalayana Srautasutra and Sankhayana Srautasutra contain verses that are similar to the Latyayana Srautasutra. According to the Mahabharata, the Sarasvati dried up in a desert (at a place named Vinasana or Adarsana); after having disappeared in the desert, reappears in some places; and joins the sea "impetuously". MB.3.81.115 locates the state of Kurupradesh or Kuru Kingdom to the south of the Sarasvati and north of the Drishadvati. The dried-up, seasonal Ghaggar River in Rajasthan and Haryana reflects the same geographical view described in the Mahabharata. According to Hindu scriptures, a journey was made during the Mahabharata by Balrama along the banks of the Saraswati from Dwarka to Mathura. There were ancient kingdoms too (the era of the Mahajanapads) that lay in parts of north Rajasthan and that were named on the Saraswati River. Several Puranas describe the Sarasvati River, and also record that the river separated into a number of lakes (saras). In the Skanda Purana, the Sarasvati originates from the water pot of Brahma and flows from Plaksa on the Himalayas. It then turns west at Kedara and also flows underground. Five distributaries of the Sarasvati are mentioned. The text regards Sarasvati as a form of Brahma's consort Brahmi. According to the Vamana Purana 32.1-4, the Sarasvati rose from the Plaksa tree (Pipal tree). In the Manu Smriti, the sage Manu, escaping from a flood, founded the Vedic culture between the Sarasvati and Drishadvati rivers. The Sarasvati River was thus the western boundary of Brahmavarta: "the land between the Sarasvati and Drishadvati is created by God; this land is Brahmavarta." Similarly, the Vasistha Dharma Sutra I.8-9 and 12-13 locates Aryavarta to the east of the disappearance of the Sarasvati in the desert, to the west of Kalakavana, to the north of the mountains of Pariyatra and Vindhya and to the south of the Himalaya. Patanjali's Mahābhāṣya defines Aryavarta like the Vasistha Dharma Sutra. The Baudhayana Dharmasutra gives similar definitions, declaring that Aryavarta is the land that lies west of Kalakavana, east of Adarsana (where the Sarasvati disappears in the desert), south of the Himalayas and north of the Vindhyas. Attempts have been made to identify the mythical Sarasvati of the Vedas with physical rivers. Many think that the Vedic Sarasvati river once flowed east of the Indus (Sindhu) river. Scientists, geologists as well as scholars have identified the Sarasvati with many present-day or now defunct rivers. Two theories are popular in the attempts to identify the Sarasvati. 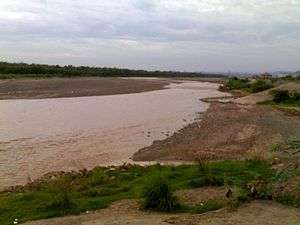 Several scholars have identified the river with the present-day Ghaggar-Hakra River or dried up part of it, which is located in Northwestern India and Pakistan. A second popular theory associates the river with the Helmand river or an ancient river in the present Helmand Valley in Afghanistan. Others consider Sarasvati a mythical river. The Ghaggar-Hakra River is a seasonal river in India and Pakistan that flows only during the monsoon season. Many scholars as well as geologists have identified the Sarasvati river with the present-day Ghaggar-Hakra River, or the dried up part of it. The main arguments are the supposed position east of the Indus, which corresponds with the Ghaggar-Hakra riverbed; the actual absence of a "mighty river" east of the Indus, which may be explained by the drying up of the historical Ghaggar-Hakra river; and the resemblance between the "diving under" of the Puranic Sarasvati, and the ending of the present-day Ghaggar-Hakra river in a desert. The identification of the Vedic Sarasvati River with the Ghaggar-Hakra River was proposed by some scholars in the 19th and early 20th century, including Christian Lassen, Max Müller, Marc Aurel Stein, C.F. Oldham and Jane Macintosh. Danino notes that "the 1500 km-long bed of the Sarasvati" was "rediscovered" in the 19th century. According to Danino, "most Indologists" were convinced in the 19th century that "the bed of the Ghaggar-Hakra was the relic of the Sarasvati." Romila Thapar terms the identification "controversial" and dismisses it, noticing that the descriptions of Sarasvati flowing through the "high mountains" does not tally with Ghaggar's course and suggests that Sarasvati is Haraxvati of Afghanistan. Wilke suggests that the identification is problematic since the Ghaggar-Hakra river was already dried up at the time of the composition of the Vedas, let alone the migration of the Vedic people into northern India. The historical Ghaggar-Hakra river, identified with the Sarasvati, flowed down the present Ghaggar-Hakra River channel, and that of the Nara in Sindh. Satellite images in possession of the ISRO and ONGC have confirmed that the major course of a river ran through the present-day Ghaggar River. In 2016, A committee constituted by Government of India constituted on Palaeochannels of North-West India: Review and Assessment, concluded that Saraswati river had two branches eastern & western. The eastern branch included Sarsuti-Markanda rivulets in Haryana and the western branches included Ghaggar-Patiali channels. The committee considers that branches met near Patiala, at Shatrana, then flowed as a large river. Late in the 2nd millennium BCE the Ghaggar-Hakra fluvial system dried up, which affected the Harappan civilisation. Giosan et al., in their study Fluvial landscapes of the Harappan civilisation, make clear that the Ghaggar-Hakra fluvial system was not a large glacier-fed Himalayan river, but a monsoonal-fed river. [note 3][note 2] They concluded that the Indus Valley Civilisation died out because the monsoons, which fed the rivers that supported the civilisation, migrated to the east. With the rivers drying out as a result, the civilisation diminished some 4000 years ago. This particular effected the Ghaggar-Hakra system, which became ephemeral and was largely abandoned. The Indus Valley Civilisation had the option to migrate east toward the more humid regions of the Indo-Gangetic Plain, where the decentralized late Harappan phase took place. Painted Grey Ware sites (ca. 1000 BCE) have been found in the bed and not on the banks of the Ghaggar-Hakra river, suggesting that the river had dried up before this period. Other scenarios suppose that geological changes diverted the Sutlej towards the Indus and the Yamuna towards the Ganges, following which the river did not have enough water to reach the sea any more and dried up in the Thar desert. Active faults are present in the region, and lateral and vertical tectonic movements have frequently diverted streams in the past. The Saraswati may have migrated westward due to such uplift of the Aravallis. According to geologists Puri and Verma a major seismic activity in the Himalayan region caused the rising of the Bata-Markanda Divide. This resulted in the blockage of the westward flow of Sarasvati forcing the water back. Since the Yamunā Tear opening was not far off, the blocked water exited from the opening into the Yamunā system. Capture of the waters of the Sarasvati by the adjoining rivers, Sutlej and the Yamuna. During the Indus period, the Sarasvati was a large river, receiving water from the Sutlej and the Yamuna. The tectonic movements during this period resulted in a distinct separation of the river Yamuna from the Indus system. Over time, these waters were withdrawn and the river became smaller and eventually dried up. The banks have undergone intense erosion leading to the collapse of the banks and drying of the river. Also, the river bed could be choked with modern moving sand. Two major shifts in the course and the volume of water associated with the river during the 3rd and 2nd millennia BC. The two major shifts were the drying of one of the important tributaries of the Sarasvati, resulting in reduced volume of water and the capture of the river Sutlej by the river Beas which rendered part of the river dry. The lack of water far down the old course threatens the vegetation necessary to help maintain the river. It is also assumed that the plains formed during the course of the river was a part of Indo Gangetic plains which later turned to Thar Desert after the depletion of River Sarasvati. The Indus Valley Civilisation (Harrapan Civilisation), which is named after the Indus, was largely located on the banks of and in the proximity of the Ghaggar-Hakra fluvial system. 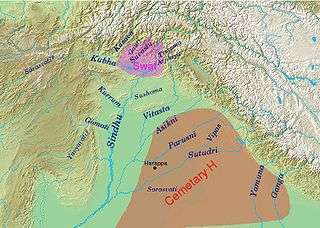 The Indus Valley Civilisation is sometimes called the "Sarasvati culture", the "Sarasvati Civilization", the "Indus-Sarasvati Civilization" or the "Sindhu-Sarasvati Civilization", as it is theorized that the civilisation flourished on banks of the Sarasvati river, along with the Indus. Danino notes that the dating of the Vedas to the third millennium BCE coincides with the mature phase of the Indus Valley civilisation, and that it is "tempting" to equate the Indus Valley and Vedic cultures. Suggestions for the identity of the early Rigvedic Sarasvati River include the Helmand River in Afghanistan, separated from the watershed of the Indus by the Sanglakh Range. The Helmand historically besides Avestan Haetumant bore the name Haraxvaiti, which is the Avestan form cognate to Sanskrit Sarasvati. The Avesta extols the Helmand in similar terms to those used in the Rigveda with respect to the Sarasvati: "the bountiful, glorious Haetumant swelling its white waves rolling down its copious flood". Kochhar (1999) argues that the Helmand is identical to the early Rigvedic Sarasvati of suktas 2.41, 7.36 etc., and that the Nadistuti sukta (10.75) was composed centuries later, after an eastward migration of the bearers of the Rigvedic culture to the western Gangetic plain some 600 km to the east. The Sarasvati by this time had become a mythical "disappeared" river, and the name was transferred to the Ghaggar which disappeared in the desert. The geographic situation of the Sarasvati and the Helmand rivers are similar. Both flow into a terminal lakes: the Helmand into a swamp in the Iranian plateau (the extended wetland and lake system of Hamun-i-Helmand). This matches the Rigvedic description of the Sarasvati flowing to the samudra, which at that time meant 'confluence', 'lake', 'heavenly lake, ocean'; the current meaning of 'terrestrial ocean' was not even felt in the Pali Canon. In post-Rig Vedic texts (Brahmanas) the Sarasvati ("she who has (many) lakes"), is said to disappear ("dive under") in the desert. According to Michael Witzel, superimposed on the Vedic Sarasvati river is the heavenly river Milky Way, which is seen as "a road to immortality and heavenly after-life." The description of the Sarasvati as the river of heavens, is interpreted to suggest its mythical nature. Ashoke Mukherjee (2001) is critical of the attempts to identify the Rigvedic Sarasvati. Mukherjee notes that many historians and archaeologists, both Indian and foreign, concluded that the word "Sarasvati" (literally "being full of water") is not a noun, a specific "thing". However, Mukherjee believes that "Sarasvati" is initially used by the Rig Vedic people as an adjective to the Indus as a large river and later evolved into a "noun". Mukherjee concludes that the Vedic poets had not seen the palaeo-Sarasvati, and that what they described in the Vedic verses refers to something else. He also suggests that in the post-Vedic and Puranic tradition the "disappearance" of Sarasvati, which to refers to "[going] under [the] ground in the sands", was created as a complementary myth to explain the visible non-existence of the river. Suggesting a political angle, he accuses "the BJP-led Governments at the centre and in some states to boost up Hindu religious sentiments and prejudices over some of the sensitive areas of Indian history." Michel Danino places the composition of the Vedas in the third millennium BCE, a millennium earlier than the conventional dates. Danino notes that accepting the Rig Veda accounts as factual descriptions, and dating the drying up late in the third millennium, are incompatible. According to Danino, this suggests that the Vedic people were present in northern India in the third millennium BCE, a conclusion which is drawn by some Indian archaeologists, but not by Western archaeologists. Danino states that there is an absence of "any intrusive material culture in the Northwest during the second millennium BCE,"[note 6] a biological continuity in the skeletal remains,[note 5] and a cultural continuity. Danino then states that if the "testimony of the Sarasvati is added to this,"
[T]he simplest and most natural conclusion is that the Vedic culture was present in the region in the third millennium. Danino acknowledges that this asks for "studying its tentacular ramifications into linguistics, archaeoastronomy, anthropology and genetics, besides a few other fields". Annette Wilke notes that the "historical river" Sarasvati was a "topographically tangible mythogeme", which was already reduced to a "small, sorry tickle in the desert", by the time of composition of the Hindu epics. These post-Vedic texts regularly talk about drying up of the river, and start associating the goddess Sarasvati with language, rather than the river. 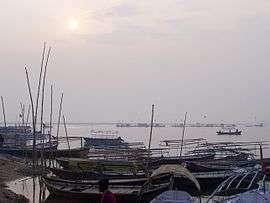 Triveni Sangam, Allahabad - the confluence of Ganga, Yamuna and the "unseen" Sarasvati. Diana Eck notes that the power and significance of the Sarasvati for present-day India is in the persistent symbolic presence at the confluence of rivers all over India. Although "materially missing", she is the third river, which emerges to join in the meeting of rivers, thereby making the waters triple holy. One who bathes and drinks there where the Gangā, Yamunā and Sarasvati join enjoys liberation. Of this there is no doubt." The Kumbh Mela, a mass bathing festival is held at Triveni Sangam, literally "confluence of the three rivers", every 12 years. The belief of Sarasvati joining at the confluence of the Ganges and Yamuna originates from the Puranic scriptures and denotes the "powerful legacy" the Vedic river left after her disappearance. The belief is interpreted as "symbolic". The three rivers Sarasvati, Yamuna, Ganga are considered consorts of the Hindu Trinity (Trimurti) Brahma, Vishnu (as Krishna) and Shiva respectively. In lesser known configuration, Sarasvati is said to form the Triveni confluence with rivers Hiranya and Kapila at Somnath. There are several other Trivenis in India where two physical rivers are joined by the "unseen" Sarasvati, which adds to the sanctity of the confluence. Romila Thapar notes that "once the river had been mythologized through invoking the memory of the earlier river, its name - Sarasvati - could be applied to many rivers, which is what happened in various parts of the [Indian] subcontinent." Sarsuti is the present-day name of a river originating in a submontane region (Ambala district) and joining the Ghaggar near Shatrana in PEPSU. Near Sadulgarh (Hanumangarh) the Naiwala channel, a dried out channel of the Sutlej, joins the Ghaggar. Near Suratgarh the Ghaggar is then joined by the dried up Drishadvati river. Sarasvati is the name of a river originating in the Aravalli mountain range in Rajasthan, passing through Sidhpur and Patan before submerging in the Rann of Kutch. Saraswati River in Bengal, formerly a distributary of the Hooghly River, has dried up since the 17th century. According to the government of Indian state of Haryana, research and satellite imagery of the region has confirmed to have found the lost river when water was detected during digging of the dry river bed at Yamunanagar. The government constituted Saraswati Heritage Development Board (SHDB) had conducted a trial run on July 30, 2016 filling the river bed with 100 cusecs of water which was pumped into a dug-up channel from tubewells at Uncha Chandna village in Yamunanagar. The water is expected to fill the channel uptil Kurukshetra, a distnce of 40 kilometres. Once confirmed that there is no obstructions in the flow of water, the government proposes to flow in another 100 cusecs after a fortnight. There also are plans to build three dams on the river route to keep it flowing perennially. ↑ See Witzel (1984) for discussion; for maps (1984) of the area, p. 42 sqq. 1 2 Valdiya (2013) dispute this, arguing that it was a large perennial river draining the high mountains as late as 3700–2500 years ago. ↑ According to David Anthony, the Yamna culture was the "Urheimat" of the Indo-Europeans at the Pontic steppes. From this area, which already included various subcultures, Indo-European languages spread west, south and east starting around 4,000 BCE. These languages may have been carried by small groups of males, with patron-client systems which allowed for the inclusion of other groups into their cultural system. Eastward emerged the Sintashta culture (2100–1800 BCE), from which developed the Andronovo culture (1800–1400 BCE). This culture interacted with the BMAC (2300–1700 BCE); out of this interaction developed the Indo-Iranians, which split around 1800 BCE into the Indo-Aryans and the Iranians. The Indo-Aryans migrated to the Levant, northern India, and possibly south Asia. 1 2 The migration into northern India was not a large-scale immigration, but may have consisted of small groups, which were genetically diverse. Their culture and language spread by the same mechanisms of acculturalisation, and the absorption of other groups into their patron-client system. ↑ Michael Witzel points out that this is to expected from a mobile society, but that the Gandhara grave culture is a clear indication of new cultural elements. Michaels points out that there are linguistic and archaeological data that shows a cultural change after 1750 BCE, and Flood notices that the linguistic and religious data clearly show links with Indo-European languages and religion. ↑ Witzel: "The autochthonous theory overlooks that RV 3.33206 already speaks of a necessarily smaller Sarasvatī: the Sudås hymn 3.33 refers to the confluence of the Beas and Sutlej (Vipåś, Śutudrī). This means that the Beas had already captured the Sutlej away from the Sarasvatī, dwarfing its water supply. While the Sutlej is fed by Himalayan glaciers, the Sarsuti is but a small local river depending on rain water. In sum, the middle and later RV (books 3, 7 and the late book, 10.75) already depict the present day situation, with the Sarasvatī having lost most of its water to the Sutlej (and even earlier, much of it also to the Yamunå). It was no longer the large river it might have been before the early Rgvedic period. ↑ Witzel further notes: "If the RV is to be located in the Panjab, and supposedly to be dated well before the supposed 1900 BCE drying up of the Sarasvatī, at 4-5000 BCE (Kak 1994, Misra 1992), the text should not contain evidence of the domesticated horse (not found in the subcontinent before c. 1700 BCE, see Meadow 1997,1998, Anreiter 1998: 675 sqq. ), of the horse drawn chariot (developed only about 2000 BCE in S. Russia, Anthony and Vinogradov 1995, or Mesopotamia), of well developed copper/bronze technology, etc." 1 2 Kinsley 1998, p. 10, 55-57. 1 2 Witzel (2012, pp. 74, 125, 133): "It can easily be understood, as the Sarasvatī, the river on earth and in the nighttime sky, emerges, just as in Germanic myth, from the roots of the world tree. In the Middle Vedic texts, this is acted out in the Yātsattra... along the Rivers Sarasvatī and Dṛṣadvatī (northwest of Delhi)..."
↑ Mythical Saraswati River | "The work on delineation of entire course of Sarasvati River in North West India was carried out using Indian Remote Sensing Satellite data along with digital elevation model. Satellite images are multi-spectral, multi-temporal and have advantages of synoptic view, which are useful to detect palaeochannels. The palaeochannels are validated using historical maps, archaeological sites, hydro-geological and drilling data. It was observed that major Harappan sites of Kalibangan (Rajasthan), Banawali and Rakhigarhi (Haryana), Dholavira and Lothal (Gujarat) lie along the River Saraswati." — Department of Space, Government of India. ↑ "Saraswati – The ancient river lost in the desert" | A.V.Shankaran. ↑ Mayrhofer, EWAia, s.v. ; the root is otherwise often connected with rivers (also in river names, such as Sarayu or Susartu); the suggestion has been revived in the connection of an "out of India" argument, N. Kazanas, "Rig-Veda is pre-Harappan", p. 9. ↑ Manu (2004). Olivelle, Patrick, ed. The Law Code of Manu. Oxford University Press. p. 24. ISBN 978-0-19280-271-2. ↑ Bridget Allchin, Raymond Allchin, The Rise of Civilization in India and Pakistan, Cambridge University Press, 1982, P.358. ↑ Special Report - Battling for India's soul, state by state. Reuters. Accessed 13 October 2015. ↑ Hans Hock (1999) translates síndhumātā as a bahuvrihi, "whose mother is the Sindhu", which would indicate that the Sarasvati is here a tributary of the Indus. A translation as a tatpurusha ("mother of rivers", with sindhu still with its generic meaning) would be less common in RV speech. ↑ Sri Aurobindo , op.cit. 1 2 Eck 2012, p. 145. 1 2 3 4 Giosan et al. 2012. ↑ Darian 2001, p. 58. 1 2 3 Pushpendra K. Agarwal; Vijay P. Singh (16 May 2007). Hydrology and Water Resources of India. Springer Science & Business Media. pp. 311–2. ISBN 978-1-4020-5180-7. 1 2 3 Upinder Singh (2008). A History of Ancient and Early Medieval India: From the Stone Age to the 12th Century. Pearson Education India. pp. 137–8. ISBN 978-81-317-1677-9. 1 2 3 Charles Keith Maisels (16 December 2003). 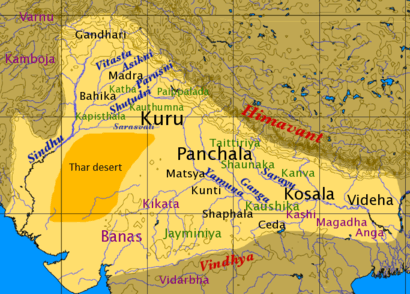 "The Indus/'Harappan'/Sarasvati Civilization". Early Civilizations of the Old World: The Formative Histories of Egypt, The Levant, Mesopotamia, India and China. Routledge. p. 184. ISBN 978-1-134-83731-1. ↑ "Proceedings of the second international symposium on the management of large rivers for fisheries: Volume II". Fao.org. 2003-02-14. Retrieved 2012-07-12. ↑ "Press Information Bureau English Releases". Retrieved 2016-10-18. ↑ PTI. "Government-constituted expert committee finds Saraswati river did exist". Indian Express. PTI. Retrieved 19 October 2016. 1 2 Danino 2010, p. 252. 1 2 Romila Thapar (2004). Early India: From the Origins to AD 1300. University of California Press. p. 42. ISBN 978-0-520-24225-8. 1 2 Witzel 2001, p. 93. ↑ Mukherjee 2001, p. 2, 8-9. ↑ A. V. Sankaran. "Saraswati – the ancient river lost in the desert". Indian Institute of Science. Retrieved 22 January 2015. ↑ Valdiya, K. S. (2002-01-01). Saraswati: The River that Disappeared. Indian Space Research Organization. p. 23. ISBN 9788173714030. ↑ Clift et al. 2012. 1 2 Giosan et al. 2012, p. 1693. ↑ Gaur, R. C. (1983). Excavations at Atranjikhera, Early Civilization of the Upper Ganga Basin. Delhi. ↑ D. S. Mitra & Balram Bhadu (10 March 2012). "Possible contribution of River Saraswati in groundwater aquifer system in western Rajasthan, India" (PDF). Current Science. 102 (5). ↑ Puri and Verma 1998, Glaciological and geological source of Vedic Saraswati in the Himalayas. ↑ Denise Cush; Catherine A. Robinson; Michael York (2008). Encyclopedia of Hinduism. Psychology Press. p. 766. ISBN 978-0-7007-1267-0. 1 2 3 4 5 6 Danino 2010, p. 256. 1 2 3 Danino 2010, p. 258. ↑ Ludvík (2007, p. 85): "The Sarasvatī river, which, according to Witzel,... personifies the Milky Way, falls down to this world at Plakṣa Prāsarvaṇa, "the world tree at the center of heaven and earth," and flows through the land of the Kurus, the center of this world." ↑ Wilke (2011, p. 310, note 574): "Witzel suggests that Sarasvatī is not an earthly river, but the Milky Way that is seen as a road to immortality and heavenly after-life. In `mythical logic,' as outlined above, the two interpretations are not however mutually exclusive. There are passages which clearly suggest a river." ↑ Mukherjee 2001, p. 2, 6-9. 1 2 3 Anthony 2007. ↑ Beckwith 2009, p. 29. ↑ Danino 2010, p. 256, 258. ↑ Michaels 2004, p. 33. ↑ Flood 1996, p. 33. ↑ Witzel 2001, p. 81. ↑ Witzel 2001, p. 31. 1 2 Eck 2012, p. 148. ↑ Eck 2012, p. 147. ↑ Zee Media Bureau (August 6, 2016). "'Lost' Saraswati river brought 'back to life'". Zee Media. Retrieved 19 August 2016. Gupta, S.P. (ed.). 1995. The lost Saraswati and the Indus Civilization. Kusumanjali Prakashan, Jodhpur. Hock, Hans (1999) Through a Glass Darkly: Modern "Racial" Interpretations vs. Textual and General Prehistoric Evidence on Arya and Dasa/Dasyu in Vedic Indo-Aryan Society." in Aryan and Non-Aryan in South Asia, ed. Bronkhorst & Deshpande, Ann Arbor. Kochhar, Rajesh, 'On the identity and chronology of the Ṛgvedic river Sarasvatī' in Archaeology and Language III; Artefacts, languages and texts, Routledge (1999), ISBN 0-415-10054-2. Oldham, R.D. 1893. The Sarsawati and the Lost River of the Indian Desert. Journal of the Royal Asiatic Society. 1893. 49-76. Wikimedia Commons has media related to Sarasvati River. Map "પ્રદેશ નદીનો તટપ્રદેશ (બેઝીન) સરસ્વતી (Regional River Basin: Saraswati Basin)". Narmada, Water Resources, Water Supply and Kalpsar Department.